From Goodreads.com: In San Francisco’s seamy Tenderloin district, a teenage street hustler has been murdered in a shelter for boys. And the dedicated priest who runs the struggling home stands accused. But despite damning evidence that he’s a killer—and worse—Father Thomas Martin stands by his innocence. And attorney Peter Donley stands with him. For three years Donley has cut his legal teeth in his uncle’s tiny, no-frills firm, where people come before profits. Just as Donley is poised to move on to a lucrative dream job, the shocking case lands in his lap, and he must put his future on hold while putting his courtroom skills to the test. But a ruthless DA seeking headlines and a brutal homicide cop bent on vengeance have their own agendas. Now, as he unearths the dirty secrets surrounding the case, Donley must risk his neck to save his client’s life…and expose the face of true evil. While this story is completely different from his Tracy Crosswhite series, it still brought to life the kind of characters and story that I have come to expect from this author. 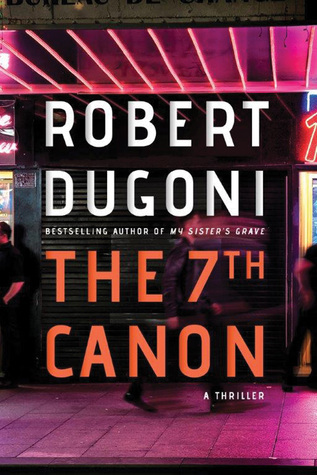 I loved these characters - from the unwavering faith of Thomas Martin to the banter between Peter Donley and Frank Ross - and all the sordid details that come to light during this investigation - The 7th Canon kept me glued to my kindle and up late reading. While this story has many twists and more than a few surprises, the one thing that (for me) kept it from being a solid 5 star read is that it becomes obvious from almost the beginning who is behind everything - and that (in my opinion) takes away from the story. I tend to prefer novels that keep you guessing about who the culprit is rather than tell you outright before the story is resolved. Overall, I do believe this story would appeal to those who enjoy a good mystery/ thriller novel with stand-out writing and a complex story-line. I would read more from this author!